Company Details: Infosys was co-founded in 1981 by 7 Engineers N. R. Narayana Murthy, Nandan Nilekani, N. S. Raghavan, S. Gopalakrishnan, S. D. Shibulal, K. Dinesh and Ashok Arora after they resigned from Patni Computer Systems. The company was incorporated as "Infosys Consultants Pvt Ltd." with a capital of ₹10,000 or US$250 (equivalent to about $652 in 2015) in Model Colony, Pune as the registered office. It signed its first client, Data Basics Corporation, in New York City. In 1983, the company's corporate headquarters was relocated from Pune to Bangalore. Change in name: The Company changed its name to "Infosys Technologies Private Limited" in April 1992 and to "Infosys Technologies Limited" when it became a public limited company in June 1992. 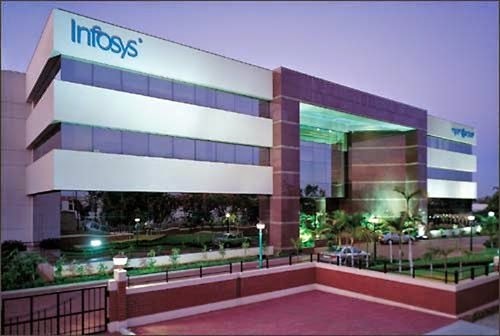 It was later renamed to "Infosys Limited" in June 2011. An initial public offer (IPO) in February 1993 with an offer price of ₹95 (equivalent to ₹480 or US$7.20 in 2016) per share against book value of ₹20 (equivalent to ₹100 or US$1.50 in 2016) per share. The Infosys IPO was under subscribed but it was "bailed out" by US investment bank Morgan Stanley which picked up 13% of equity at the offer price. Its shares were listed in stock exchanges in June 1993 with trading opening at ₹145 (equivalent to ₹740 or US$11 in 2016) per share. In October 1994, it made a private placement of 5,50,000 shares at ₹450 (equivalent to ₹2,100 or US$31 in 2016) each against book value of ₹10 (equivalent to ₹46 or 68¢ US in 2016) per share to Foreign Institutional Investors (FIIs), Financial Institutions (FIs) and Corporates. In March 1999, it issued 2,070,000 ADSs (equivalent to 1,035,000 equity shares of par value of ₹10 (equivalent to ₹30 or 45¢ US in 2016) each) at US$34 (equivalent to $48.38 in 2015) per ADS under the American Depositary Shares Program and the same were listed on the NASDAQ National Market in US. The total issue amount was US$70.38 million.